Now it is here. The most realistic mod ever. TrueCombat. 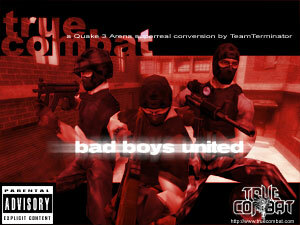 TrueCombat (Q3TC or TC for short) was first introduced in September 2000 and its last build (.45b12) was released in December 2001. The game was actively played until late 2003 - but still has the occassional gamer once in a while. 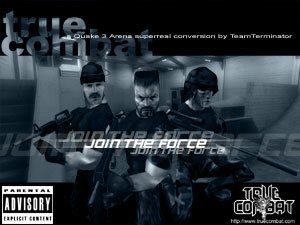 TC is a tactical-realism modification based on the ID Software title "Quake III Arena". You will not need to have Team Arena installed to play TrueCombat, just the original ID Software release "Quake III Arena". TrueCombat is developed by "TeamTerminator" (TT for short). The weapon, damage and movement systems have all been changed in TrueCombat from vanilla (standard) Q3 style. We have created realistic Maps, Models, Sounds, Textures, Effects and modified various other asspects of Q3A in order to try and stay as close to the reality as possible.